U! Happy Events, an NGO founded to aid marginalized children with Republican College, a 60-years old community college in Cubao, Quezon City will host a fund raising event to help over 4 million out of school Filipino youth. Along with additional partners - WhenInManila.com and Calle Baclaran, the group brings Up Dharma Down on May 28, 2016 at 6pm at Greenfield District Central Park, Mandaluyong for the benefit show dubbed as Street! 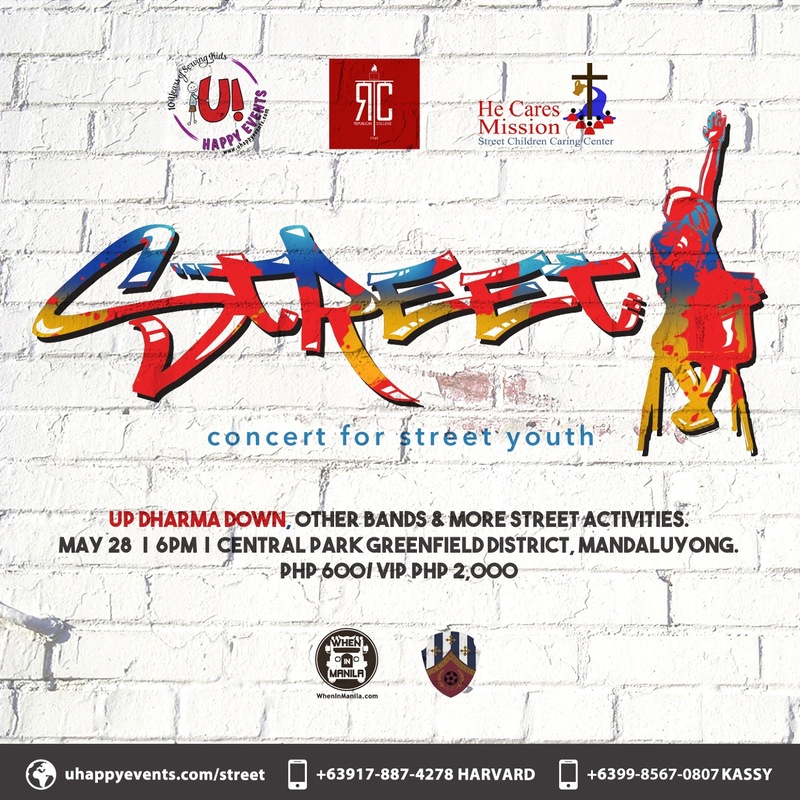 : concert for street youth. Collected funds will be donated to He Cares Foundation, another organization caring for street kids. Other performers include Maude, Lenses, The Ring Master, Women’s Business Hip Hop (Bebe Riz + Jug Honeyluv) and Crossline Acoustic. The program will also showcase other street activities such as art mural, face painting and street magic. Regular tickets costs Php 600 while VIP tickets are available at Php 2,000. VIP entitles you to exclusive front seats, dinner buffet at Splice Restobar (right of the stage) plus 2 drinks. You may also buy tickets online and just redeem it during the event itself. Just present the deposit slip to prove your purchase.